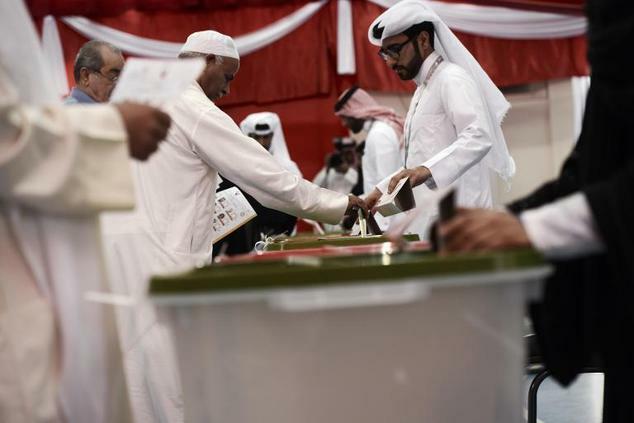 Bahrain has voted in the country’s first parliamentary elections since protests erupted in the wake of the Arab Spring in 2011. The government called on all Bahrainis to cast their ballots. However, the Shia-led opposition boycotted Saturday’s legislative and municipal elections, calling them an attempt to entrench “absolute rule”. Despite being ruled by a Sunni monarchy, the majority of the Bahraini population are Shias. Protesters took to the streets in 2011 to demand greater rights, but the government, backed by Saudi tanks, moved in to crush dissent. Talks to resolve the situation have since collapsed and unrest has continued. A coalition of opposition groups has called the poll a “sham” and demanded an elected prime minister who is independent from the al-Khalifa monarchy. The government was hoping for a strong turnout to back up its contention that the opposition represented a small minority of Bahrainis. Bahrain is of strategic importance to Washington and hosts the US Navy’s 5th Fleet. Correspondents say the election is also being closely watched by Saudi Arabia, which has a large Shia Muslim population in its Eastern Province.